Get your herb plants from a good garden center nursery who will have plenty of garden advice to help you with your inside garden. You will need some garden equipment like a small digging garden tool, garden gloves, organic fertilizer and some small gardening containers. You probably already have most of these garden supplies in your garden shed. Soil is the most important aspect of growing herbs indoors. Use only top grade potting soil with an organic fertilizer mixed in. If you think it is too fine a soil, use a little perlite. Fertilize while potting the herbs and they should be happy until spring. If you have an herb that is not growing vigorously add a little organic liquid fertilizer to the water. When you go to transplant the herb, go one inch up in the size of the gardening container. If the plant is in a two inch pot, go to a three inch gardening container. Leave the roots alone and be careful not to bruise the stem. Don’t plant oreganos, mints, lemon balm or bee balm with other plants because they will overgrow everything. Pot these herbs in a garden container all their own. You may want to always plant those herbs in containers since they tend to “take over” the garden. Some people swear that you must put garden stones in the bottom of the gardening container, but I dispute that opinion. I feel that the garden stones take valuable space away from the herb roots. You might want to place a small piece of wire screening over the hole to keep it from getting clogged. Allow time for your herbs to grow used to their new conditions. Once you see growth you can start using you herbs. Snip and use your herbs often to encourage them to grow full and bushy. 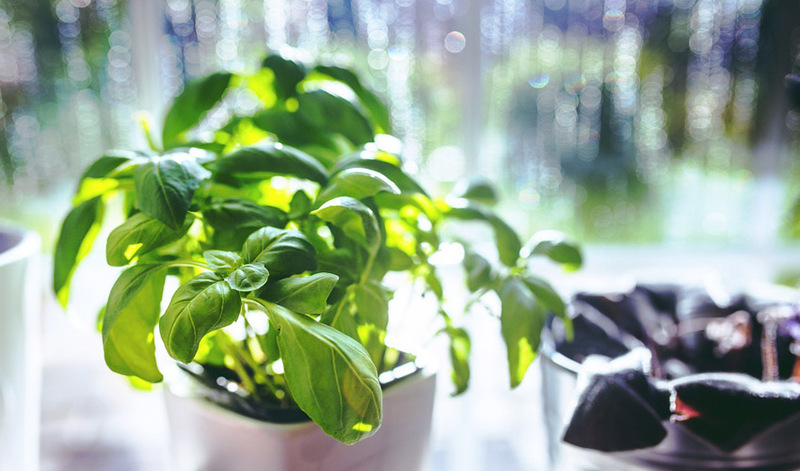 When it comes to light, all herbs must get 4 to 6 hours of sunlight a day on your window sill. If your window doesn’t supply that much light then purchase garden grow lights and hang them three inches above the plants. If you live in a very hot climate shade the herbs during the hottest periods. If you live in a very cold climate keep the herbs away from the cold glass panes. When it comes to watering, don’t let the herbs dry out but don’t drown them either. Herbs do not like to sit in wet soil. An inexpensive water meter from your garden center nursery will help with this important step in growing your herbs. Always use room temperature water so as not to shock the herb’s roots.